Search for Ocean homes for sale. 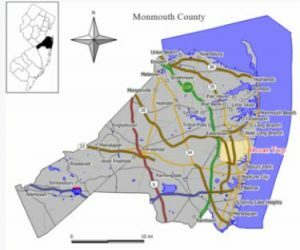 Ocean Township, Monmouth County NJ is located near the Jersey Shore. There are three main sections of Ocean Township. Wannamassa, Oakhurst and Wayside. Wanamassa and Oakhurst are the nearest to the Atlantic Ocean. Indeed, Wayside is on the western side of Route 35. Many of the Ocean homes for sale are detached single family homes. However, there are more homes in Ocean that are in active adult communities and condos, which by the way, are all in Wayside.. Prices can range from the starter home price range to well over $1 Million. Ocean Township is an attractive destination for commuters because NJ Transit has service available at the Long Branch Station. Also, the Garden State Parkway is close at Exit 100, and buses are available to New York. Routes 35 & 18 go through Ocean. In addition, Eatontown Mall offers shopping, restaurants and more. Up and down Route 35 are many other smaller shopping centers and restaurants.In fact, the Atlantic Ocean is a short drive away form the homes in Ocean. New York City is a train ride away, and in addition, Popular Pier Village in Long Branch is close. PNC Art Center in Holmdel presents big name concerts throughout the summer. In Red Bank you’ll find The Count Basie Theater and also Twin Rivers Theater. These two venues host plays and concerts year round. Ocean Township is part of the Ocean Township School District. Students in grades K – 12 in Ocean Township, in addition to Loch Arbor, attend these schools. The Ocean Township School District has three elementary schools, and one middle school in addition to one high school. When students from Ocean Township enter high school they may also apply to one of the five high schools in the Monmouth County Vocational School District. Specialized courses are available in fields such as computer science, and biotechnology. Also courses in the medical and science fields are available, among others. According to the 2010 Census there were over 27,000 people living in the homes in Ocean. The median household income was $100,682. Call 732-598-7700 today to see Ocean homes for sale.